Well. Those were the longest 2 years of my life. In case you didn't read part 1. In short, girlfriend started holding her poop after our trip to Disneyland (while I was about 20 weeks preggo with boyfriend) and I became a poop doula. Since we do everything as naturally as humanly possible, that meant there was no dosing her up with miralax. It meant using prune juice, flaxseed, and greens to make the poop soft, and if she held it for more than 3 days, getting in a hot soapy bath with epsom salts and coaxing her to push the largest poops in history out. We also recently found at Whole Foods a brand called Buddy Bear that has a "laxative" (it's just an amped up pruned juice, it doesn't actually force them to go) and one called "Digest" that we started using. Sometimes it meant getting in there and breaking it up a bit. And sometimes it meant enema. Any way you slice it, these were not good times for either of us. It seemed that this past April we were finally finally over it. But we had a few relapses. When family came to visit, or we were out all day long, or the wind blew a certain way... And she absolutely refused to push them into a potty. Le sigh. So I found a book. Yup. This book. It actually used the idea of someone missing a family (we used Nemo since we were all about that movie). 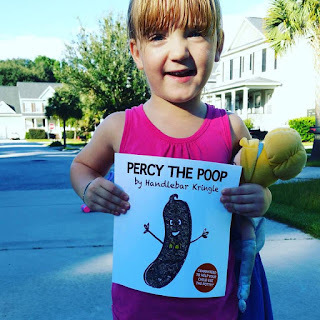 Percy the Poop wants to see his family that lives in the toilet bowl. We were obsessed with this book....but still no poop in the potty. UGH. Enter Halloween. We trick or treated a little bit, and she did not ask to eat any of her chocolate. She just wanted a dum dum lollipop (because of course she wanted red dye and sugar nonsense. of course she did). She loved it. The next day, in Whole Foods, they had Halloween candy on sale. A huge bag of organic lollipops for 99 cents. So I bought it, since my ice cream, chocolate, buy anything she wanted motivation wasn't working at all. We got home. I said "Look I got you some lollipops, but you can only have one if you poop on the potty." She grabbed it, ran to the bathroom, and took a dump. ARE. YOU. FREAKING. KIDDING. ME. So. yeah. We found the golden ticket. And she has gone on the potty every day since then. Just like that. Potty trained. The most insane roller coaster of emotion finally coming to a close. A very happy 4 year old who loves to poop on the potty now (with or without a lollipop), and a mom who finally feels less judged about her older toddler in diapers, and a freedom from obsessively counting poops and praying there wouldn't be any scrubbing out the bath tub moments each week. Suddenly, we're over it. It was a long journey FOR SURE. But honestly, I would rather take this journey than have filled her full of a laxative so that she couldn't trust her body to do what it needed to do. And who knows at the young age what that could do to a developing gut. Lord knows I have enough stomach issues (I was also a holder as a kid) and I'm just hoping this will result in a healthy gut and a healthy attitude about poop. And also. She loves it when I draw Percy. She asked me to draw his brother. 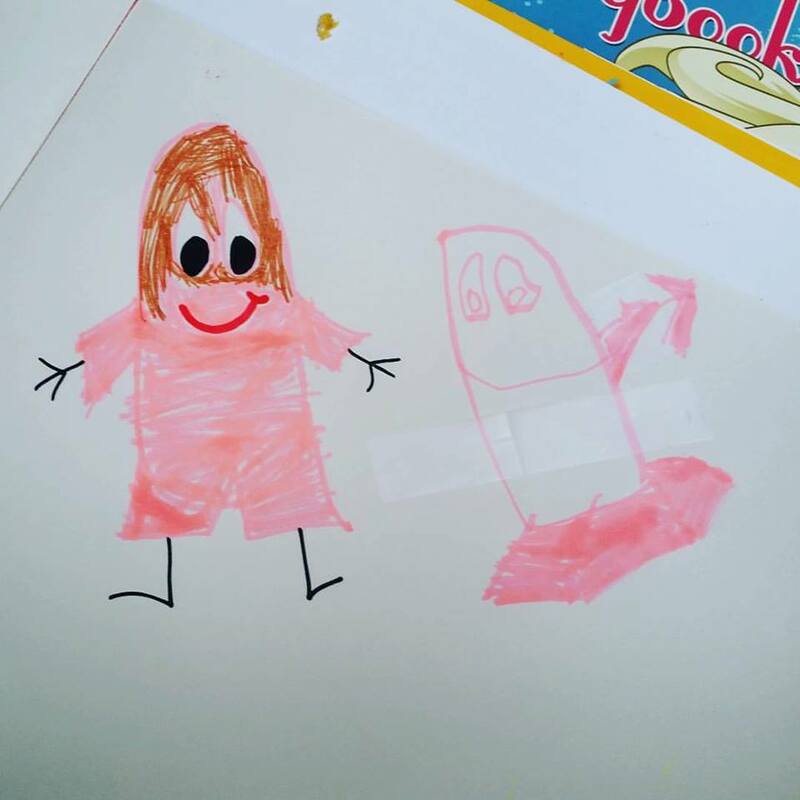 Then she drew his sister. I just super heart her.